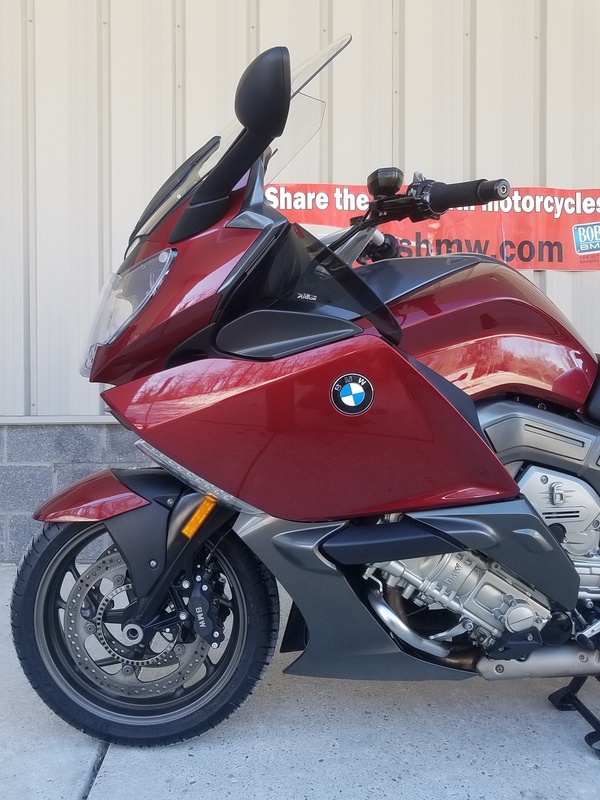 This very stunning 2012 BMW K1600GT in BMW’s super sharp Vermillion Red factory finish is available now! BMW’s extremely popular, large capacity, sporty luxury touring model is fully loaded and set-up for miles and miles of fun. 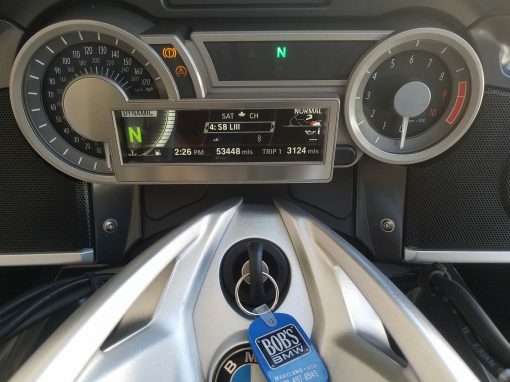 This GT was purchased new from Bob’s BMW. 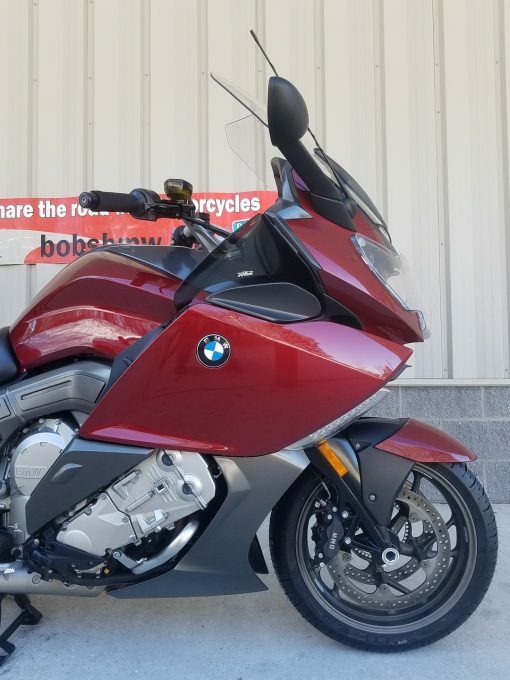 Our master certified BMW technicians set it up fresh from the factory and we delivered it to the first owner in December of 2013. 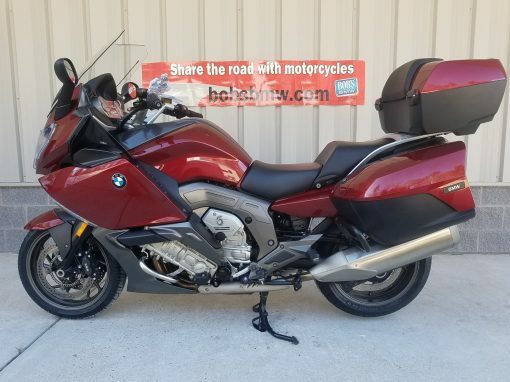 We ordered the bike fully loaded from BMW with every available option at the time. 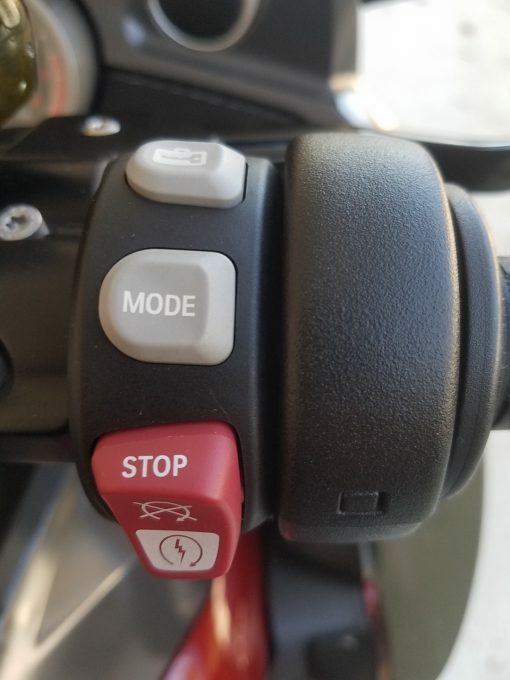 It comes with Bluetooth interface, GPS prep, audio system with Sirius radio option, ESA II suspension (electronic suspension adjustment), TPM, adaptive headlight, DTC (dynamic traction control), central locking system, anti-theft alarm and BMW’s state of the art front and rear ABS. 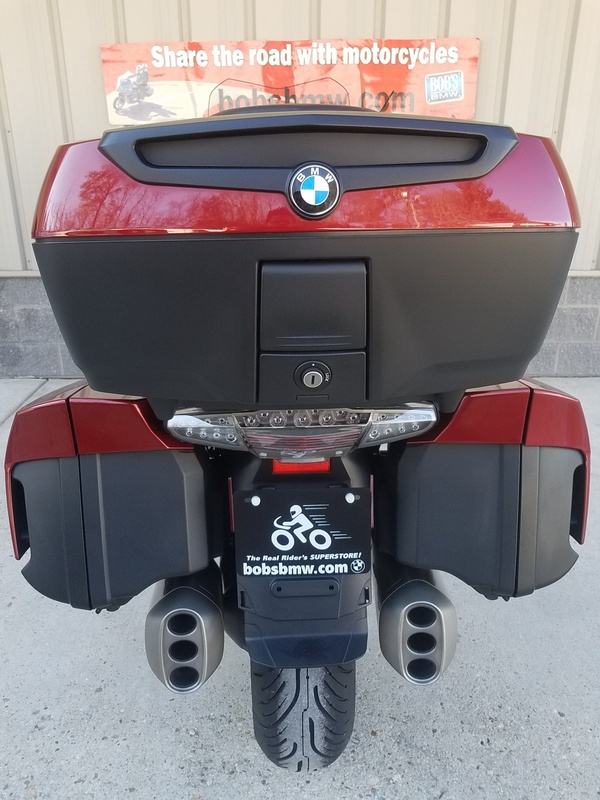 All of the services on this bike have been completed here at Bob’s BMW by our master certified technicians. From the first 600 miles break-in service completed on time at 627 miles to the installation of the accessories and all the annual and mileage services and tires – this K1600GT has been pampered. The previous owner added some really nice touring accessories, including a paint matching and key matching top case. It comes with barely used side case liners, a larger Aeroflow touring windscreen, Aeroflow winglets and headlight cover. 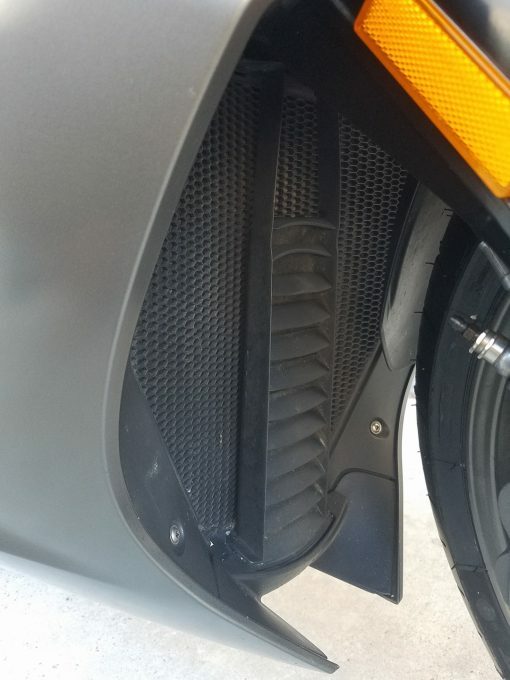 The previous owner also added a really nice looking and functional black front engine guards with matching rear case guards. 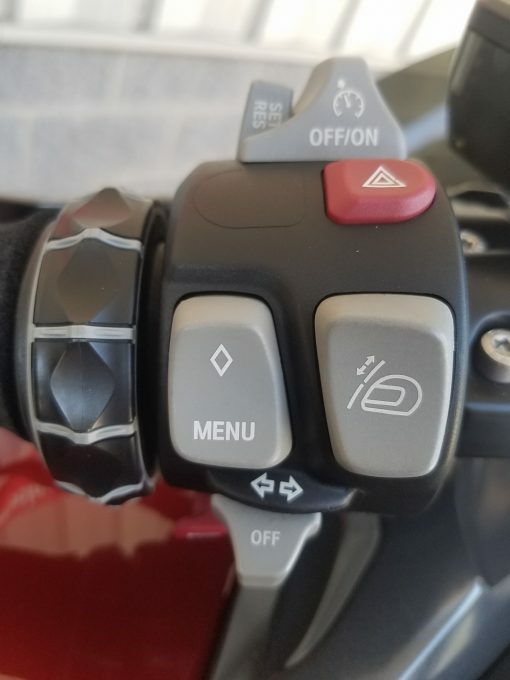 These do a great job and look like they came stock on the bike. There is also a side stand foot enlarger and a we wired in an adjustable heat controller to dial in the comfort level on heated gear when the connector is installed. 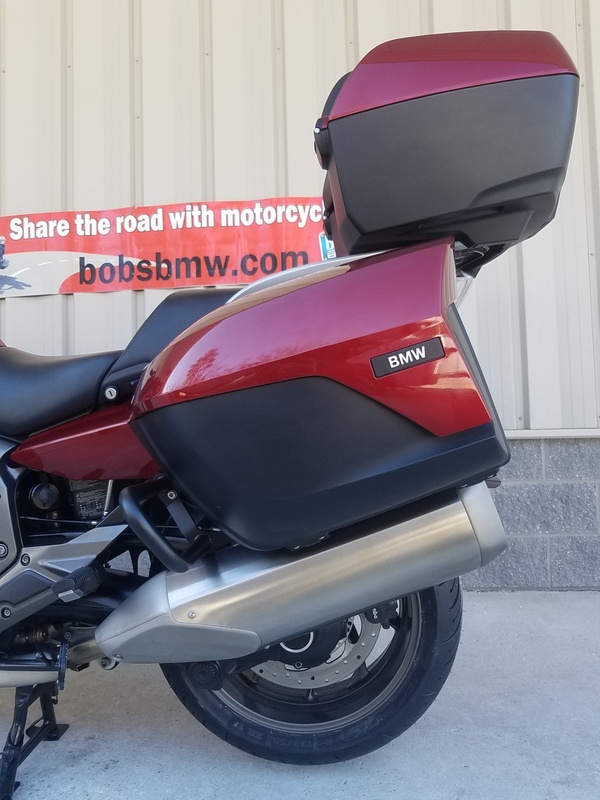 This K1600GT was extremely well cared for and loved and you can see from the pictures and here at Bob’s BMW that the previous owner was a great rider (no drops), was very thoughtful about the accessories that he added and took the time to detail, clean and service the bike regularly. 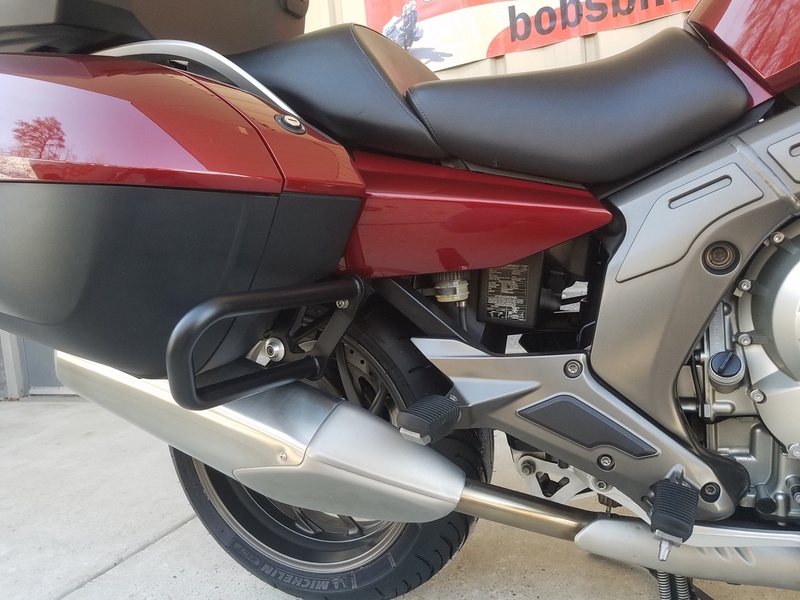 It’s great when we get these opportunities to help find a new owner for a bike this clean. 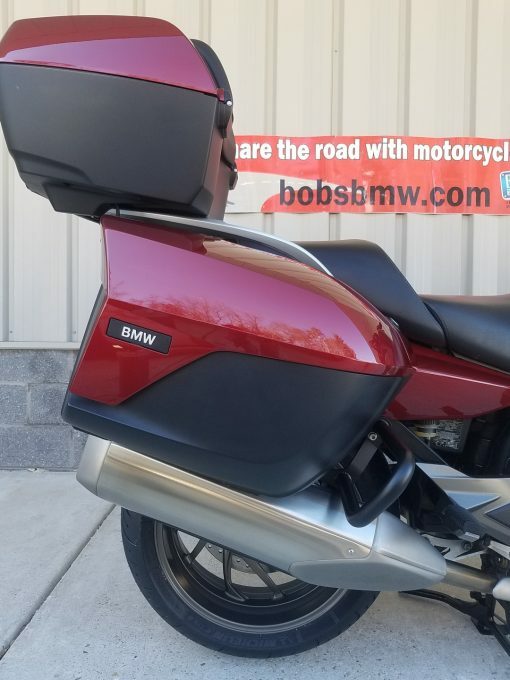 To ensure that we are offering only the best, we have run it through our extensive Pre-Purchase Inspection, and the ADVANTAGE CERTIFIED Evaluation process along with the Maryland Safety Inspection. Buyers of a Bob’s BMW Advantage Certified motorcycle like this one are entitled to a host of benefits including a free loaner when they come in for their first service, 30-day major mechanical warranty, and discounts and special pricing on highly recommended Zurich extended warranty or Tire & Wheel policies. 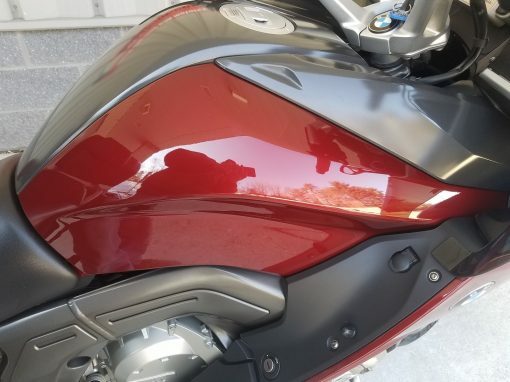 This bike passed all its inspections and evaluations perfectly as you would anticipate. It is safe and roadworthy in all possible respects. But we’ve gone further and taken it out for an extended test ride along with updating any warranty or outstanding recalls. We also reviewed the very long and extensive service history here at Bob’s and made the decision to get ahead of an upcoming service so the next owner will have nothing to do but enjoy the riding season ahead. We installed brand new Michelin Pilot Road 4 GT tires both front and rear along with nitrogen for longer lasting and more consistent tire pressure and completed a full 54k service including engine oil and filter and a full brake fluid flush front and rear and resetting the service calendar. 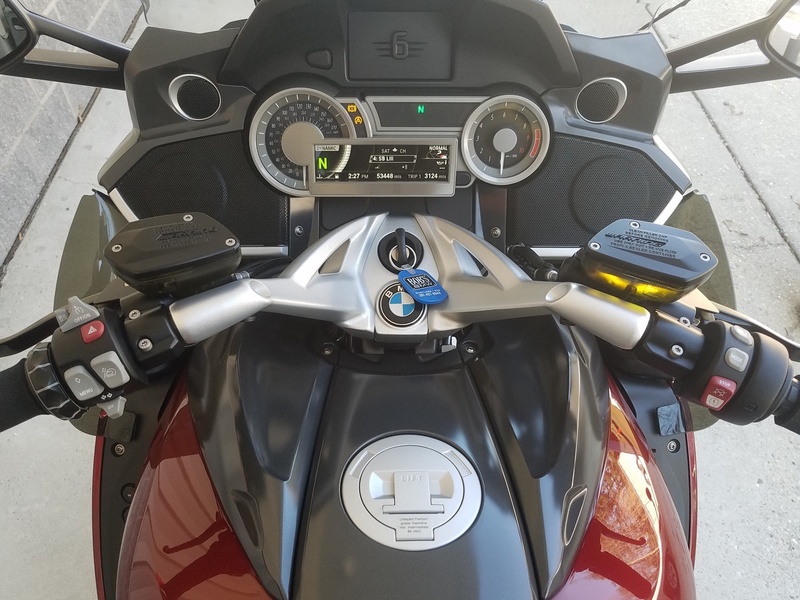 The K1600GT is ready for the road. Cosmetically it looks really clean and is in fantastic shape. While we did perform our usual professional full detailing, it arrived in pretty spotless condition to begin with. 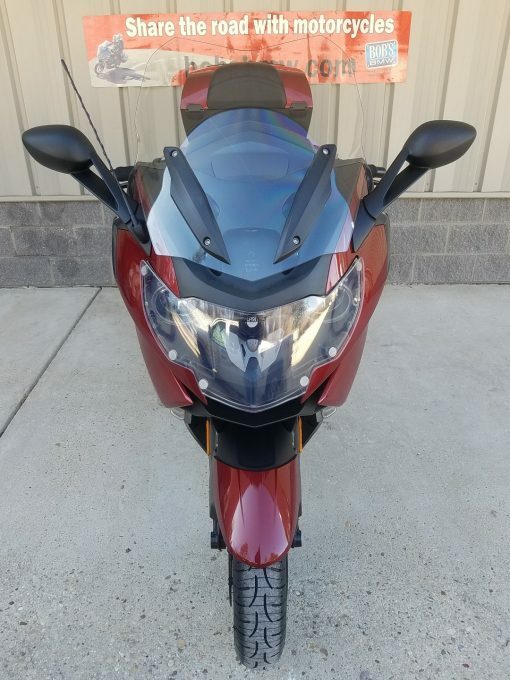 Look over these dozen good clear images and we know that you’ll agree there would be few fully serviced 2012 K1600GTs in equally perfect condition be found anywhere in the greater Washington DC, Northern Virginia, Suburban Maryland or greater Baltimore region. 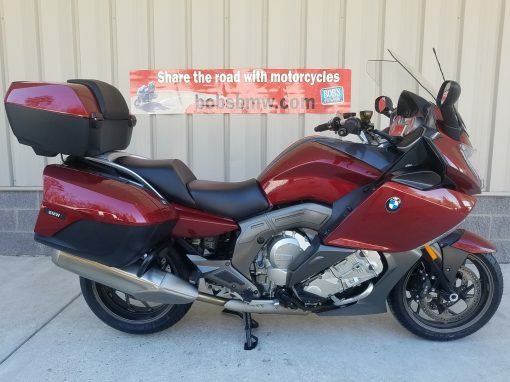 At 53,449 miles this K1600GT looks like it has less than 12,000 miles on it. There are some small surface scratches on the side cases and a couple very small chips from rocks that have been touched up and are very hard to see. The paint itself we would rate a very critical 8.5-9 out of 10, and the wheels, windscreen, gauges, controls, misc. hardware etc. a 9 to 9.5 out of 10. Super clean bike. So don’t think about this great opportunity too long; get to Bob’s and do something about it today. We have great financing and extended coverage option available for all qualified buyers. It comes complete with the original owner’s manual, factory supplied tools and 2 keys and 2 BMW key fobs. 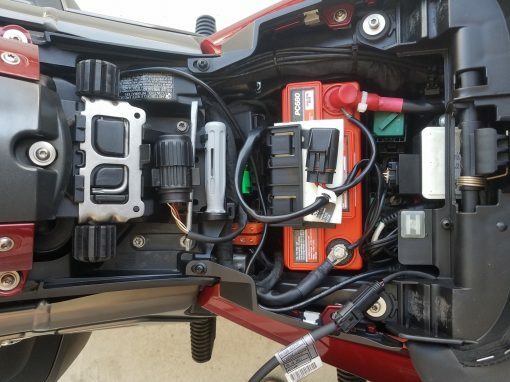 • Fully Serviced, Inspected, Ready for the ROAD!